Discussion in 'The Lounge' started by DirtMcGirk, Jan 5, 2011. So I've been kicking around the idea of taking the front sway bar off of my 2005 Tacoma. I have the long travel kit on my truck, a 3" coil over lift, so on and so forth. I've noticed that in the dirt that the sway bar limits the truck, but I am unsure of what it would drive like on the street. I know the sway bar keeps the other side of an independent suspension design down when one side lifts up. That's about all I know. So is there a good reason to limit my truck with this thing, or can I loose it and not worry? You have LT and still use the stock sway bar? Do you still have stock lowers? I know plenty of people with LT trucks with no sway bars and they have no issues. Obviously drive it like its a truck and not a sports car and you'll be fine. Still have the stock lowers, but went to the coil overs and upper a-arms from the LT on the front end. You will notice a significant amount of body roll through turns. It can be unsettling at first, so as long as you don't drive like a jackass you should be okay. No need to remove it however, you could get some quick disconnects to hook it back up for the road and enjoy the rattling from those. you'll notice some body roll. whether it is tolerable to you or not is up to you. I had a lifted jeep cherokee that I removed the swaybar on, having leaves in the rear it didn't sway to bad unless I was under hard braking and cornering simultaneously. I had a lifted jeep wrangler with coils all around that I ran with no rear swaybar but kept the front with disconnects for off road, it wasn't too bad, except under tight left hand turns it would often pick up the left front tire, and if I gassed it I could carry that tire through the whole turn. When both front and rear sway bars were disconnected this particular jeep displayed extensive body roll, however it felt 100% safe up to 55 mph. I've also ran with the front sway bar disco'd and the rear hooked up on a similar coil sprung jeep, and that again displayed a fair amount of body roll. I ran a YJ (leaf sprung) with no sway bars or trackbars, and it was fine, 3.5" lift and 36" tires. Try it for your self, every vehicle is different, the only adverse affects you will notice are body roll and different handling, it's up to you to decide if you can tolerate those changes or not. Do it. Those pesky engineers that put it on were just being pussies and don't know what they're doing. Besides...when you crash because it was a retarded idea, you can sue them. Did you somehow think someone like narlus or IAB started this thread??? Increased Body roll, lack os stability in ho speed maneveurs, lack of stability in emergency maneveurs. I've driven my Jeep for 2 years/60k miles with the sway bar disconnected. I have JKS quick disco's, and just keep the links in the back of the Jeep (basically just throw them on for annual inspections JIC). It's only lifted 2" with 31's, so not majorly high CoG, but body roll is noticeable (and fun) in corners. Rides much smoother, but you will potentially wear out steering/suspension components more quickly. Edit - just remembered Yota's are IFS...not sure how differently that will effect your truck over a solid-axled Jeep. Anybody besides me watch "Two Roads to Baja" featuring the FJ Cruiser? The amateur one, first thing they do after removing the roll bars is do donuts in the dirt and ROLL IT!!! Apparently they did understand the name of the component was literal. Greatest part of that segment is that THE Rick Johnson rolls up on his moto to see if everyone is OK. When you douche yourself in front of a camera like that in front of a legend...it's almost more win than a camera can capture. I took mine off for awhile on my f350 while I was doing the bushings. Couldn't tell the difference and this was on an 8000# truck with a lift. Don't drive it like a ricer and you'll be fine. You will be fine with out the sway bar. If you still wanna be able to drive it hard on the street go with some quick disconnects like others have already mentioned. Take it off. Immediately. Also plz loosen all lug nuts and a couple of tie rod ends. This could be a great contribution to Western civilization. this is an LOL thread. They really are that special, they serve a very important purpose on a vehicle. It is in fact safety device. You have extended travel dampers and an upper A-arm for more droop, and your sway bar actually still fits on? That's getting to the point where you might destroy the end links if one side goes to full droop and the other is going to full compression. On my '07 Tundra with the 12-13" Camburg kit that's on the front, the sway bar can't even be put back on with the front end jacked up and will basically bind before it goes to full droop of I were to install it at ride height. I removed mine to see how it felt (it's also what the coilover manufacturers recommend), and I experienced LESS body roll with suspension that was properly sprung. The coilovers changed the front springrate from 575 lbf/in to 650 lbf/in and a much higher air charge and chamber diameter as well. Between that and the proper damping, the body roll is well under control even with the front end leveled with the back (2.x" lift). What I also experienced is wheel articulated and independence that allowed the truck to be driven up super rutted choppy **** REALLY fast with very little lateral input to the body. I don't know what kit you put on the Tacoma, but most all the aftermarket coilover options that lengthen the travel also go to a higher springrate as well. Sway bars are a band-aid fix for a springrate selection that is made for comfort in a straight line on a road and not cornering or highspeed performance. As other people said, don't drive like you're trying to avoid the cops and you'll be fine. If your vehicle is lifted you should be adjusting your driving regardless of the sway bar being there or not. Right now I am running the 4" Camburg lift kit with the Sway-a-Ways on the front and the rear with the new leaf pack in the back end. The front coil overs are running a 150# nitrogen charge (same in the back) with 650# springs on the front coil overs. The reason I asked this to begin with is that I noticed that even with the Camburg sway bar move blocks I am finding that the lower coil of the coil overs is rubbing on the sway bar. Supposedly the two red blocks I put under the sway bar were supposed to prevent this, but it didn't really seem to do much. The other reason I was thinking on this removal was that I want to run some armor plate down there to protect the diff and the front end. Right now the company I am into for sheet metal is running a special for plates that don't clear the front sway bar. Figured if I could save some money and deal with the noise all in one hit, that's a win win. I concede the point about modifying the vehicle and then flipping it as far as legal liability. However, just with going to a 4" lift and 33" tires, I have had to modify my driving style. This isn't my Ducati and its not my old BMW, so I don't drive it like that. I don't know what kit you put on the Tacoma, but most all the aftermarket coilover options that lengthen the travel also go to a higher springrate as well. Sway bars are a band-aid fix for a springrate selection that is made for comfort in a straight line on a road and not cornering or highspeed performance.As other people said, don't drive like you're trying to avoid the cops and you'll be fine. If your vehicle is lifted you should be adjusting your driving regardless of the sway bar being there or not. while I don't agree 100% I believe there is more win in this entire post than there is in the rest of this thread. Answer me this than.... why do the most hi performance vehicle sold on the road have them? Seriously.... Every vehicle on the road has a sway bar at minimum on the front, The shorter the travel of a vehicle, the less its going to be effected by a swaybar as it is, putting a longer travel system on a vehicle would increase the effect of not having the sway bar. Its main job isnt so you dont feel body roll, its to prevent the vehicle from hi-siding. Dont get me wrong, I am the first one to remove a sway system for offroad use. Without it, your tires dig differently while cornering, suspension travel is more independant. BUT, a sway bar is defenetly not just a band aid, it is in fact part of the suspension system, and it is in fact made out of a spring steel. Something I have seen done on alot of vehicles that want better cornering ont he road, is to put bigger sway bars on<diameter>. This doesnt effect the ride whatsoever. Driving down the road it is just as smooth, but what you get is stiffer cornering on the street. What I can see doing with a truck like this is maybe going with a smaller sway bar to allow a more happy medium? I understand wha tyou are saying, I understand the use of a sway bar, but a truck like this, is not a race car, and can be driven without a swaybar safely if he doesn't drive like an idiot. I don't know about a smaller diameter (ie more flexible) swaybar, I don't see why it wouldn't be worth a shot, other than the added cost. The truth is the correct answer is swaybar disco's, or an adjustable sway bar like the currie anti rock. But he didn't ask about that, he asked about removing it completely. Is Dirt REALLY being held back in his off-road forays by his sway bar? I'd say his retardation is the big hindrance here, but I'm just speaking based on the facts he's presented over the course of the last several years. You are correct. The sway bar is "spring" steel, and it does contribute to the vertical forces on each corner when the positions differ by essentially being a torsion spring. When the wheels move up at the same time, it contributes no springrate. Also, in the case of a car high-siding, it reaches it's critical point when the inner most wheels no longer contact the ground. In a longer travel setup, having that inner side droop out and articulate more to get SOME kind of cornering traction is very critical. A sway bar limits that, and on paper can prove to change that critical point by a few degrees for the worse - especially when comparing the scenario of stock springrate w/swaybar to aftermarket suspension w/stiffer springrate and longer travel and w/o swaybar. It makes more sense when worked out on paper with a proper free-body diagram. The big reason why a sway bar is chosen in the design process is that for automotive suspension, the springrates/shock rates/wheel rates are all selected based on the desired natural frequency of the suspension with consideration to the input frequency of the terrain. That comes first, and if it comes down to the springrate being on the low side for cornering, you can get the best combination of cornering performance, bump absorption, and comfort with the least compromise to each with a sway bar installed. Either situation will be a compromise of some kind. For strict road purposes, beginning the design with the intent of comfort and bump absorption with the sway bar added makes the most sense. Dirt, 150psi sounds low for a Camburg/S.A.W. damper. All the 2" and 2.5" diameter bodies I've come across come spec'd for 200psi or 250psi depending on the year and the company that re-brands it. Also, 4" lift sounds beyond the norm for all the Camburg kits I've seen. Most are 2-3", and that amount of preload has an upper limit based on the maximum available stroke in those Eibach springs (the free length can only be so long to fit on those shocks). Preload it to more height than what it's made for and you could be getting coil bind before you hit the bump stops...that's bad, and it rides really high in the travel and doesn't give as much droop. Or up-travel for that matter if the coil is binding. If you're getting any kind of interference, call Camburg. They're usually very thorough with that sort of thing, especially for the OEM replacement kits they sell. In the rare instance something does interfere, they probably have a fix for it (I had to get new lower spring collars for my coilovers that raised the spring out of the way of the tie-rods so they wouldn't rub near full steering lock - sent out for free from Camburg/S.A.W.). Also ask them about the charge and the safe amount of total lift. You can call them up and talk to the guy who designed all of it, so take advantage of that. Anti-sway bars are *NOT* a band-aid fix. You WANT them! Like all of the other suspension components, they need to be tuned for your vehicle and it's intended use. 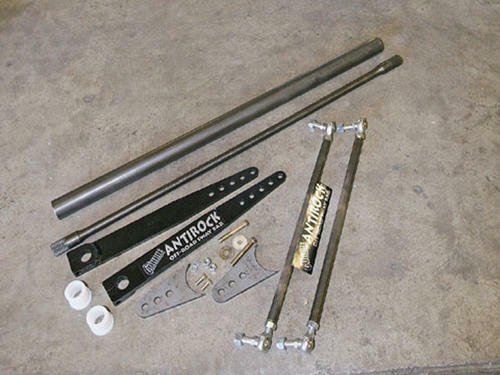 For a coil sprung and solid axle Jeep, Currie antirocks work awesome. They're softer on road, but you can tune them to balance your suspension so that all 4 wheels are working together and you can still achieve full travel. ORO also makes an anti sway bar called the swaylock that I would prefer in your situation because it has the softer rate of a Currie antirock bar, with a stiffer rate that can be selected for on road use. It has some reliability issues though, and I have a Jeep, so I have Currie antirocks front and rear. If Savvy Offroad ever produces a version of Blaine Johnson's dual rate anti-sway bar, that's what I would choose for my Jeep, and what I would suggest for your tacoma. I don't recommend sway bar disconnects though. Those things are trash. After reading all this stuff. I am still not convinced you need them. Rip those phuggers off! Worry about it later. Atleast thats what I would do. Those adjustable ones..... those are the ticket for a modified truck. Sway bars have absolutly NOTHING to do with the stiffness or softness of the ride of any vehicle..... the one and only purpose of a sway bar is safety and stability while cornering. Let me give this as the best analogy..... Sway bars are like helmets, or knee pads...... As long as yournot crashing... your dont "Need" them right......... 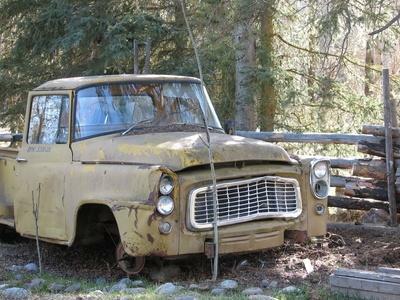 But lets say your in a corner and something comes off the back of someone elses truck, or a kid runs out, or someone cuts a corner ETC....... Thats when your really going to need the sway bar. Thats when your going to "need" the added stability that a sway bar gives to a vehicle. Those that want to take them off all the time... its your truck, its your life..... Belive as you will..... But Please truly understand what the actual purpose is before removing what is truly a safety item. I agree with Mike's liability scenario. Look what happened to Ted Kennedy when he removed his at Chappaquiddick. I don't run one in the front and rear of my cherokee. The spring rate is pretty high on the front with longer coils and also coil spacer. I feel safe driving it and don't feel like it has excessive body roll. However, i've seen jeeps sway pretty far because of larger/softer coils even at slow speeds. Before the ridemonkey reg hater squad jumps on you, do it yourself and see how it rides. Nobody likes to admit defeat but if you really want to spread knowledge, tell us how it goes. It is pretty amazing the varied knowledge of monkeys. If you filter out the douchebags. You can get some good info here. I like to consider myself a douche. But seriously...a thicker sway bar REALLY helps and does not affect the ride quality of the car. I put in a pretty thick one on my BMW back when I was gonna start tracking it. Made a pretty huge difference in the cornering ability of the car. 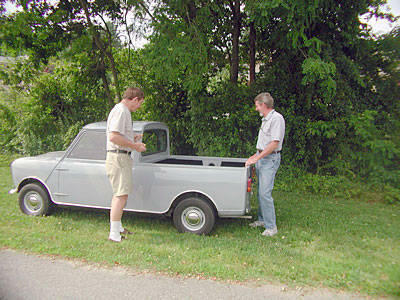 Then again...that is for a car and not a truck but am assuming it's the same basic thing. I ordered a thicker bar that works with the quick disconnects that I already had coming. Monday I'll call Camburg and figure out what's going on with the sway bar rubbing on the springs. Its annoying to have people know you're coming. Speaking off... Anybody remember Ladder Bars?